On January 31, 2018, the Council of the Autonomous Province of Trento approved motion no. 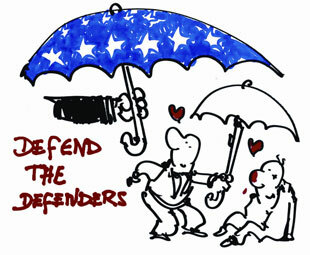 638 on the theme of the protection of human rights defenders. The motion was proposed by the councilor Violetta Plotegher and signed by all the other councilors and majority leaders. With the approval of the motion n. 638, the Council commits the Government to activate temporary protection programs and training for threatened human rights defenders. Furthermore, it urges the national government to ensure that the Italian diplomatic corps strengthens its initiative to protect human rights defenders and, finally, instructs the regional government to promote opportunities for deepening and exchange of experiences on the role of human rights defenders and shelter cities. Professor. Marco Mascia, Director of the University Centre for Human Rights of the University of Padova, said that "the motion on Human Rights Defenders approved by the Council of the Autonomous Province of Trento attests to the political will of local authorities to play an increasingly important role from the city to the UN. After the success of the campaign conducted by hundreds of Italian local authorities for the recognition of the right to peace, achieved with the UN Declaration of 19 December 2016, the Trento motion strengthens the role of local authorities as primary actors of subsidiarity and fundamental interlocutors, together with civil society organizations, national and international institutions to protect democracy, human rights and the rule of law. The effects of the processes of globalization directly affect the local communities, that is without the filter of the central institutions of the states. The local authority has to face problems that are of world order problems and since it is on a worldwide level that these must be faced primarily and resolved, the local authority is legitimized to intervene directly at the global level"
The motion of the Autonomous Province of Trento meets the global need to protect human rights defenders and responds to advocacy work carried out by associations such as Yaku ( organization active in Latin America) and In Defense of. The motion obtained the support of the Trentino Forum for Peace and Human Rights. "In Defense Of - for human rights and those who defend them" is a network of over 30 Italian organizations and associations active on issues such as human rights, environment, international solidarity, peace and disarmament, workers' rights, freedom of the press and the rule of law.